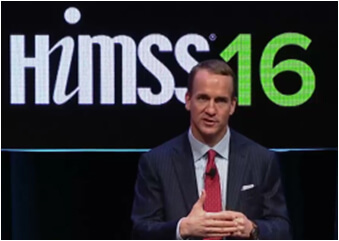 In his closing keynote at HIMSS16 in Las Vegas, Denver Broncos quarterback Peyton Manning, the then reigning Super Bowl champ, spoke about leadership, teamwork and battling through adversity. When teams “work in unison, toward the same goal, each playing his specific role at the highest level possible, the results often defy the odds,” he said. Disclaimer: Peyton Manning is not endorsing OneSource Solutions. This audio clip is provided as an educational resource for those who were not able to listen to his inspirational remarks at HIMSS16 .